THE “BOYCE” ARE COMING BACK. 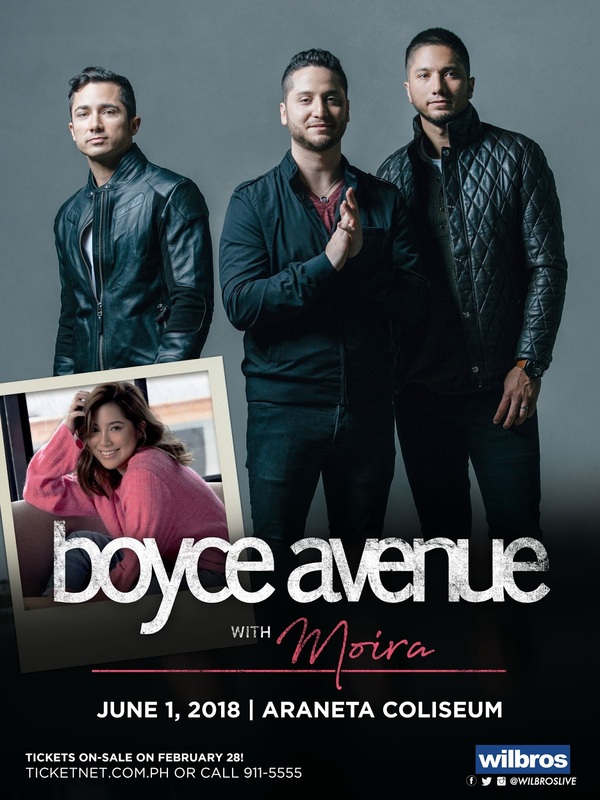 One of the biggest independent bands in the world – BOYCE AVENUE, are coming to Manila for a concert on June 1st at the Araneta Coliseum, together with the most streamed local artist now in the Philippines, MOIRA. Boyce Avenue is comprised of the three Manzano brothers – Alejandro (lead vocals, guitar, piano), Fabian (guitar, vocals) and Daniel (bass, percussion, vocals). The Florida-based band was formed in 2004, and in 2007 they started posting videos on YouTube sharing not only their original songs, but also their distinctive acoustic covers with the world. The videos resonated instantly and to date the band's YouTube channel has amassed over 3.7 BILLION Views and over 10.6 MILLION Subscribers. On YouTube, the band is ranked above such artists as Justin Timberlake. Drake, Miley Cyrus, Sia, and Imagine Dragons. The brothers have forged a lasting and passionate digital fan base on other platforms as well, with over 3 MILLION Facebook likes and a half million Twitter followers. Joining them on this concert is MOIRA, one of today’s favorites and one of the breakout stars of 2017 after winning the Himig Handog 2017 with her song “Titibo-Tibo”. She has massively increased her popularity and it was her song “Malaya” - theme song from the movie “Camp Sawi” that made her the “movie soundtrack queen of this generation”. Hopeless romantics and even the broken-hearted can’t get enough of her hugot renditions of “Torete” and “Sundo”, as well as her other songs such as “Tagpuan”, Huling Gabi”, “Kita Na Kita” and “Saglit”, among others. Moira’s first two-night concert at the KIA Theater over the weekend sold out in just a few days.